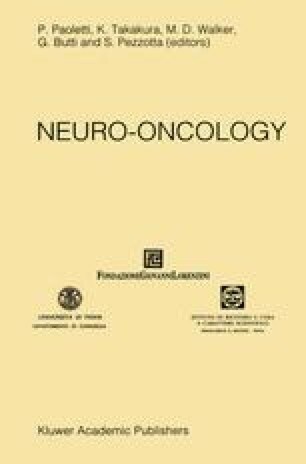 Fifty-five consecutive patients with recurrent intracranial malignant astrocytomas were reoperated at Memorial Sloan-Kettering Cancer Center from 1972 to 1983. The median survival after reoperation was 36 weeks. Prereoperation Karnofsky rating and extent of surgical resection were the most important independent factors related to survival after reoperation (P < 0.01 and P < 0.05 respectively). Twenty-five patients (45%) had improved Karnofsky ratings after reoperation, and 32 patients (58%) who were independent after reoperation were able to stay so for more than 6 months of their survival time (median value). A patient who does better after reoperation is one with a prereoperation Karnofsky rating of ≥ 70 in whom extensive resection of the tumor is accomplished. 1.Division of NeurosurgeryUCLA Medical CenterLos AngelesU.S.A. 2.Section of NeurosurgeryMemorial Sloan-Kettering Cancer CenterNew YorkU.S.A.